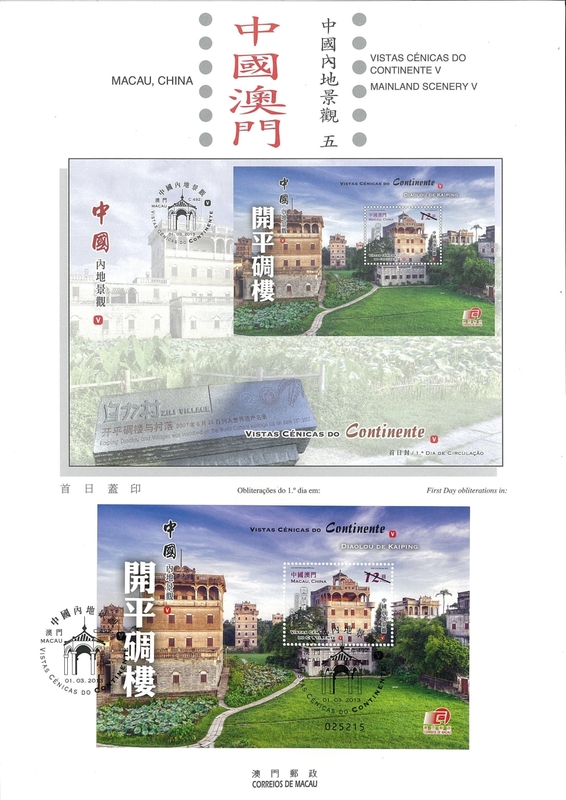 Macao Post will release the fifth issue of souvenir sheet series "Mainland Scenery" on 1st March, 2013, Kaiping Diaolou and Villages as the theme of this issue, it is inscribed on the UNESCO’s “World Cultural Heritage List” in 2007. Kaiping Diaolou is located in the villages of Kaiping, Guangdong Province, the emergence can be traced back to the middle and late period of Ming Dynasty. Most of the existing buildings were constructed in 1920s and 1930s, built by emigrants returning from abroad, mainly from Europe and America, different kinds of overseas architectural styles were brought back along with them, which reflects the harmonious integration of Chinese and foreign architectural and decorative forms. 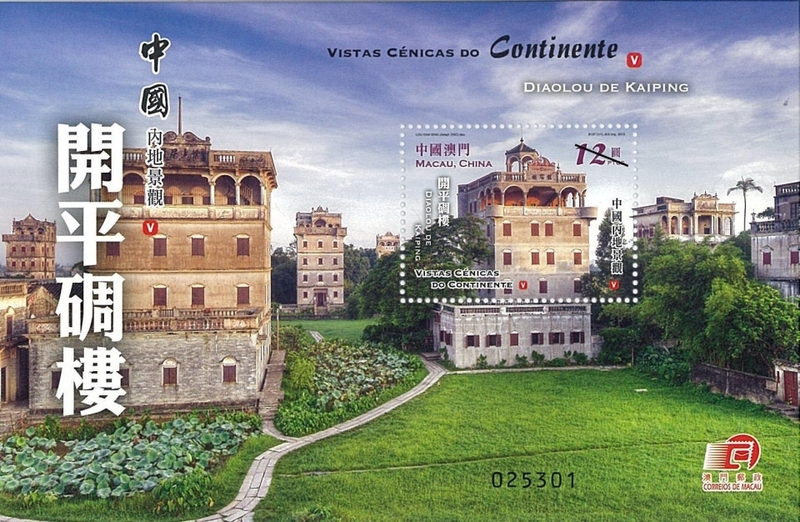 There are 1,833 Diaolou left in Kaiping, they could be classified into three major types by function: night towers, communal towers and residential towers. 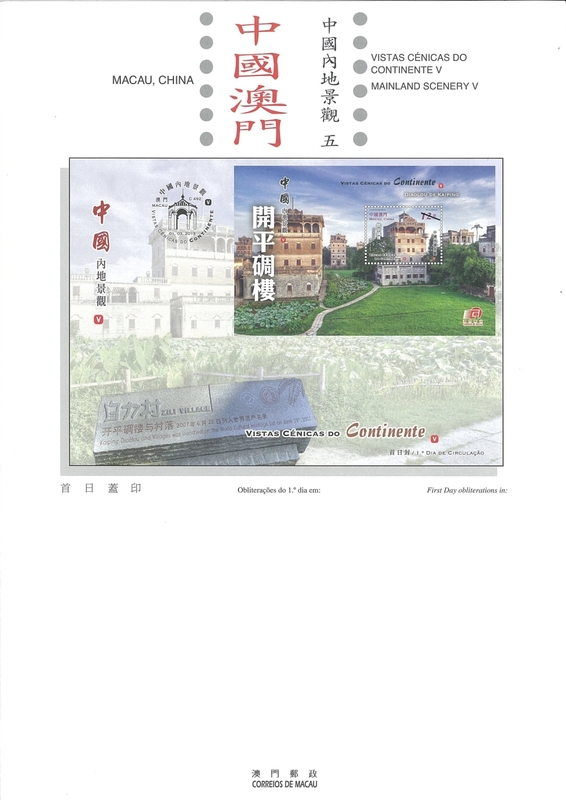 The image of this souvenir sheet highlights the finest building in the Zili Village in the Tangkou Town Kaiping City – Mingshi Lou Tower, built in 1925, with 6 floors. 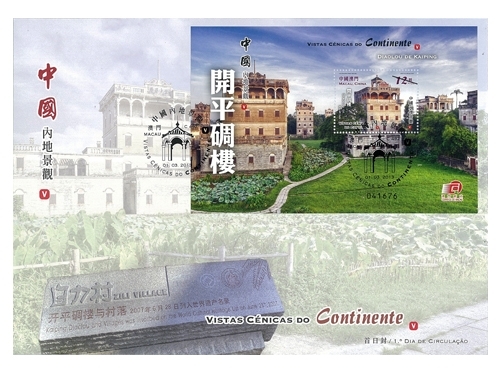 On the left side of the souvenir sheet is the Yeshengjulu Tower, built in 1930. Around the towers, smell of lotus, footpaths between field, with many trees and bamboos, and beautiful landscapes with mountains and water, a harmonious environment to live. This is the third issue in 2013. 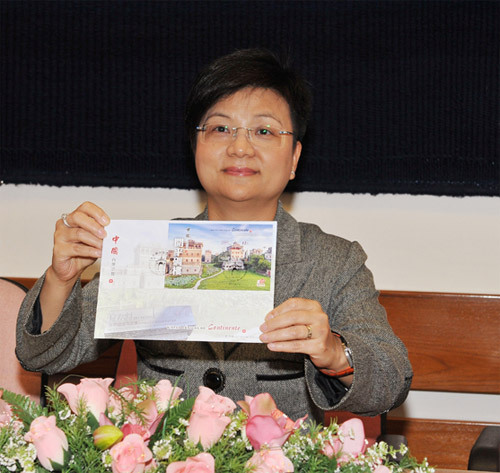 The previous issued stamps are “Lunar Year of the Snake” on 03/01/2013 and “Centenary of the Macao Chamber of Commerce” on 23/01/2013.